Volume II, Number 35 Published by Students of New College, Sarasota, Florida HURRICANEIII Damage Lig ht In First Storm To Hit Campus Alma, the season's first hurricane, passed within thirty miles of Sarasota Wednesday night and caused damage to the New College campus. According to Captain Ralph Styles, Development Officer, the only structural damage caused by the storm was the loss of "a few awnings on the administration building." About ten palm and pine trees were lost, however, he told The Catalyst, and it would be "three to four days" before the grotmds could be completely cleaned of moss, branches, and other debris. Meanwhile, official campus activity slowed almost to a standstill yesterday as power failures affected both sides of the campus. The west campus was the harder hit, as a total blackout made electric lights and typewriters inoperative. Because the college has its own water pwnp on the west campus, the blackout affected the water supply there, as well. Buffet lunches of cold cuts were served on paper plates, because there was no electricity with wluch tn cook and no water with which to wash dishes. The college switchboard was also affected by the power failure, rendering most of the telephones on the west campus useless. On the east campus, limited cur rent was flowing yesterday a.ft! :J' a total power failure had blacked it out from approximately 11 pm Wednesday night to 6:30 am Thursday morning. Enough power was available to service the dormitory rooms, but the swimming pool generator and the air conditioning system were out. Captain Styles said yesterday he was in touch with Florida Power and Light, and repairs would "hopeful ly" be made by the end of this week. Alma was the closest any hurricane had ever come to Sarasota since New College was built, according to Captain Styles, and the school was "fortunate" that damage was as slight as it was. He attributed the good fortWle to "the time and effort spent Wednesday by Mr. Minter and also the construction contractor in picking up and securing things. Al Minter is head of the grotmdkeeping crew. His men spent the greaterpart ofWednesday securing loose and fragile items around campus. Construction work on Hamilton Courtwashaltedyesterday, as most of the workers stayed home to clean up their own yards, according to Styles. Work was continued today, however. Although there were no broken windowsorothermajor.damages on the east campus, some student rooms suffered minor carpet damages when the force of the wind pushed rain underneath the door. Meetings Postponed Meetings of the College Council and the Student Executive Committee were postponed Wednesday due to Hurricane Alma. The Council meeting has been re-scheduled for this afternoon at 3: 30; no definite word was available at presstime as to whether the SECmeeting will be re-scheduled, as well. Steve Hall, SEC chainnan, did say, however, that a meeting would be held "sometime Saturday" or 11we won1t have one at all this week. 11 While Hurricane Alma receded from the Sarasota area, her effects lingered yesterday in testimony to her power. A lonely traffic sign stands among rocks washed onto a beach road by the force of Almas winds and waves, left. At center, first-year student Dave Rogg stands on pier behind College Hall to catch the spray of the incoming waves. At right', students examine aforty-foot pine tree that was uprooted duringthe storm, fortunately missing the window to a student residence. 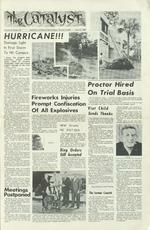 Proctor Hired On Trial Basis Fire works lnl uries The Wackenhut Corp., a contract security service represented locally by C. W. Wierts, was chosen "on a trial basis'' earlier this week to provide a combination proctor-security officer service. Prompt ConfISCatIOn have been set at. 9 pm to 3 am on weeknights and 9 pm to 4 pm on Fnday and Saturday rughts. Of All Exploslves Viet Child Injuries, reportedly due to cherry bomb to two students this week prompted Dean of Students Robert Norwme to demand all explosives be turned in by 8 pm today under penalty of "imrnedi ate expulsion." In a note to students posted yesterday, Norwine originally said all explosives must be turned in at the student reception center by 8 l:st night. However, Bill Chadwick, chairman of the Student Disciplinary Committee, said Norwine had subsequently agreed to extend the deadline 24 hours. First-year students Cheryl Hess and Edna Walker were treated at Norwine S a r a so t a Memorial Hospital for minor injuries from cherry bomb explosions in s e p a r a t e incidents during the week, according to col lege nurse Mrs. Fran LeMasters. Edna was injured Sunday and Cheryl on Wednesday. Possession of explosives or firearms of any kind is prohibited under room agreements signed by all students residing at the college. H EW G r a nts N C $ 157,866 The Department of Education, and Welfare (HEW) has given New College a grant of $157, 866 to help pay for the classroom building now under construction on the East Campus. The funds were allocated as a Title One grant tmder the Higher Education Facilities Act of 1965. Ring Orders Still Accepted Students who did not order a class ring from the Herff-Jones representative Wednesday may still place an order. Karle Prendergast, chairman of the Ring Committee, will accept ordersfor several days. Interested students should see her immediately. Winner of the New College feature race at the benefit night at the Sara sota Kennel Club was Janaam whose owner, Eddie Alderson, is shown receiving a trophy from President John Elmendorf. At left is Judge Bernie Collins and at right is track general manager Jack Collins. Proceeds of the race went to the New College scholarship fund. Sends ,. Wierts, area supervisor for T an lc r Wackenhut, has been acting as .proctor-security agent f o r the past New College's ter child" thank e d students ana expressed an interest in marbles in his first letter to his "foster parents." Ei ght-year-old Nguyen Dinh Khuong wrote the students in a letter dated May 12, One of seven children, Nguyen lives with his family in An Binh, about 34 miles from Saigon. Stu dents here have been helping to support Nguyen with cash gifts and letters relayed through the Foster Parents Plan, Inc. The text of his letter, translated by the Foster Parents organiution, is as follows: "My dear foster parents: "I write this letter to respectfully i n q u i r e if you all are in good health. If so, I'm most happy, As for me over here, P m as well as usual. "Daddies and Mommies, I received for the first month a bar of soap, an amount of five hundred and eighty piastres (VN$580), and VN$300 (US$4. 13) rice m on e y My parents used your cash grant c o v e ring books, copybooks and schoolfeesformysiblings and me. "I'm attending the 1st grade by now and I've plenty of classmates. At recess, I like to shoot marbles best as I'm practising how to become a good player. 11Well, that's all for this time, I and hope this finds you safe and well all the time. I'm deeply obliged to you for your kind assistance. (signed) Nguyen Dinh Khuong The Iceman Cometh An ice machine was installed on the east campus this week. A coin-operated, bag dispenser type machine has been placed outside the entrance of the laundry room in the old barracks. "lt1s here on a trial basis, Captain Ralph Styles, Planning Officer, said. 11We'llkeepit it it's used enough." Styles said fifty bags a week would have to be sold 11for the machine to pay for itself. He added, however, he does not expect that many will be sold 11 at least until the new class comes in. n week. "I like to start a new j o b and look it over, u he told The Catalyst. Wierts plans t o use two men, probably splitting them up one five Wierts days, the other two. He indicated he might be one of the two men. problem i.s finding someone right to work the job with me, he said. "Usually, a man in his SO's would be most stable for a job like this." He said an older man would tend to be too unflexible for the job, while a younger man would tend to become too personally involved in student problems. Dean of Students Robert Norwine made the decision to engage the Wackenhut Corp. after consultation with administration and studei:t: representatives. Competing with W ackenhut for the school's contract was Officer Ritchie, who had been acting as campus proctor and security agent for the past two months. Both Ritchie and Wierts presented proposals for a proctor last Thursday before representatives of the admihistration and the students. Ritchie had suggested that the duties of proctor and security agent be separated. He said it defeats the purpose of a proctor to leave the residence hall area to patrol otl1er parts of the campus. ln presenting his proposal last Thursday, Wierts told the group assembled to interview him he was looking foiWard to trying the job. He said, "This thing's going to be a challenge.